I had a disagreement this week with a fellow bookseller about whether I could use “meditative” to describe books, and if I did, would that talk someone into reading it? I was trying to describe that feeling I get when I read a work of transformative literature, whether fiction or nonfiction, that inspires me to be a better person. It’s both inspiring and empowering. Perhaps I’ll call it the Three Cups of Tea syndrome. I think Eat Pray Love would be another, particularly the “pray” part. Narrative nonfiction has flagged a bit this year, with Tea and Eat continuing to sell, but no titles in the genre breaking out at the same level. I think the biggest success we are having is with The Zookeeper’s Wife, that wonderful book by Diane Ackerman about the Jews who were sheltered during the Holocaust at the Warsaw Zoo. Another book that has definitely had legs that spoke to the “eat” part of Elizabeth Gilbert’s book is The Sharper Your Knife, The Less You Cry, the adventures of Kathleen Flinn at Le Cordon Bleu cooking school. Both books had good reviews, wonderful reads from booksellers, and now strong word of mouth. And isn’t it odd that I can’t seemingly write anything without talking about a French book? Another aside--I keep calling Flinn's memoir "The Sharper the knife, the less you cry" and according to a certain search engine, so do a lot of other people. The book, however, that I thought and still think has the best chance of being the next Tea Syndrome book is Kate Braestrup’s memoir Here if You Need Me. It’s Braestrup’s life as a minister to game wardens in Maine. She took up the calling after losing her husband (before his passing, he himself hoped for that ministerial post) and offers stories from the field mixed with lessons she’s learned. It’s one of those inspirational books that appeals to both believers and skeptics, perhaps because she doesn’t discuss exactly where she gets the inspiration to do the right thing. As she’s a Unitarian Universalist, she doesn’t even exactly say whether her belief system is a religion or a philosophy. Alas, I can’t find the other notes, but trust me, there was some passionate enthusiasm in the house. Hey. It’s all the spirit of Thanksgiving. In fact, this all only came up because Nancy asked me if I knew a good book to recommend for a Thanksgiving roundup. My other choice was A Charlie Brown Thanksgiving...with stickers! If you finish Here if You Need Me and you aren’t grateful for something, I’ll be very surprised. Coming next: a really special gift book you may not have seen anywhere else. This week we received word that Europa, the little publisher that could, has gone back to press for 20,000 more copies of The Elegance of the Hedgehog, bringing the total up to 65,000 copies. Europa publisher Kent Carroll (you may recognize his name from the old imprint Carroll and Graf) states “Given the current economic climate, the book’s growing popularity is remarkable. It now appears that it may duplicate here its European pattern of growth from modest to phenomenal.” Quel magnifique! When our “Inside Flap” blog featured a report from Paul Schmidtberger on what was selling in France last year, I never suspected that one of those titles would be a runaway bestseller for us in the fall of 2008. We have fallen for this gem as much as France, and it’s clearly one of the cornerstones of our French Revolution of 2008. We recently sent an email newsletter with various booksellers waxing about the charms of Barbery’s novel, and you’ll find it featured in our Holiday Gift Guide’s centerfold as one of our favorite fiction titles of 2008. I’ve taken to calling it “L’Elégance du Hérisson” but my accent is a bit Hercule Poirot (Sacre bleu!) and is not taken seriously. What of Kent Carroll’s contention that this book could jump from indie favorite to mainstream American phenomenon? Would the stylized cover work in mass merchants? We love the philosophical discussions of the characters, the appreciation for Japanese design esthetic, the subtle pokes at class consciousness, and the ending (no, I won’t give it away) that veers the story away from the sentimental. Can this resonate with the American mainstream? The answer from Europa is a qualified yes. Europa’s success was just what they were hoping for when they moved their distribution to Penguin. Their paperback sales force, under the guidance of the incomparable Trish Weyenberg, has become well-know for creating paperback breakout bestsellers of The Kite Runner, The Memory Keeper’s Daughter and The Friday Night Knitting Club. To me, it seems comparable to the higher profile that NYRB classics had after moving distribution to Random House. Last year, our bookshop had enormous selling John Williams’ Stoner and Elaine Dundy’s The Dud Avocado. This year our hopes are pinned on a reissue of classic Daphne Du Maurier’s Don’t Look Now, led by Schwartz Bookshop buyer Catherine Wallberg, who called Du Maurier “a phenomenal talent.” She’s also been very hot on Justine Picardie’s Daphne, a novel about Du Maurier’s obsession with the Brontes. So you could say Wallberg is obsessed with Picardie who is obsessed with Du Maurier, who is obsessed with the Brontes. More about Europa Editions and their French Voices program here. Next Up: a wonderful book on thankfulness that did not quite take off in paperback the way we expected. Here’s our paperback fiction bestseller list for this past week. It’s been about the same for the last month. It’s generally been a truth in bookselling that nothing is harder to sell than books in translation. I could go on at length about the problem in general (and probably have, and probably will again), but for now, I want to touch on one language, French, that seems to be having a resurgence in 2008. In past years, as a buyer, I would laugh when a sales rep told us that a novel won the Prix Goncourt or the French Giller, or some other prize awarded to folks who wrote in the Gallic tongue. It was more like the kiss of death more than anything else. That was all before Suite Francaise. The phenom that is Irene Nemirovsky’s unfinished quintet of novels opened the doors to more wonderful releases, or perhaps more attention for them. Perhaps nothing speaks of the moment better than Jean-Marie Le Clezio, the newest winner of the Nobel Prize for literature. Because most of his works were from small presses, we’ve actually had trouble getting stock of his titles. (Please reserve a copy at one of our shops). Another interesting aside, his early titles were published by Atheneum, a now-dormant imprint controlled by Simon and Schuster. The trick is that Simon lost the rights on the book, but the French publisher did not own the translation—they had to come to an agreement or get the book retranslated. The first result of that agreement is Le Clezio’s first novel The Interrogation , which is scheduled for December release. As always, you can preorder from us in our shops or our web site. It hasn’t been only Holocaust stories that have benefited, though we’ve seen a number. It’s also been hitting mysteries, as foreign settings are very hot right now in the genre. Sarah’s Key may be the most direct beneficiary to Nemirovsky’s breakout. It’s a contemporary novel about an American in Paris who discovers, while writing for the magazine, the tragedy of Vel D’Hiv, the roundup of Jews in Paris during Nazi occupation. Her story alternates with one young girl’s experiences at that time. Parisian de Rosnay, who has both French and English background, wrote this book in English after numerous books in French. She told me on her recent visit to the JCC Book and Culture Fair that she found the language change freed her to explore a difficult subject in France. Sarah’s Key has been a French bestseller, but de Rosnay chose to have someone else translate it. She says it would have taken years for her to translate it on her own. She thought the time would be better spent writing her next book, which will also be in English. Publishers are also now furiously translating her previous novels into English. Sarah’s Key has become a phenomenon at our shops, particularly at our Mequon location, where Jane and Morgan are recommending it hand over fist. It’s so much fun to get caught up in the enthusiasm, which started straight from our Macmillan rep, Anne Hellman. I also would highly recommend hearing de Rosnay speak—she’s quite inspiring. Nancy Huston also straddles two worlds, and also looks to a little-known incident during Nazi occupation in Europe. Her newest novel Fault Lines tells the story of four generations of one family, going backwards, through the eyes of six-year-old children. The story slowly unlocks the secret of one atrocity, and how the baggage passed through generations. The structure of the story is very powerful, and it’s one of those books that you feel compelled to reread to spot all the clues. Our Brookfield bookseller Peggy made me promise not to discuss the plot at length, so you’ll have to read this article in the Independent for more. You might want to wait until after you’ve finished the book. Huston also writes in both French and English, but she prefers to do her own translations. Another interesting fact is that she won honors from both the Orange Prize (shortlist) and Prix Femina (winner), which mirror each other in terms of qualifications. Anyone can win the Prix Femina, but the judges are all women. For the Orange Prize, anyone can be a judge, but only a woman can win. Huston and de Rosnay are counterpoints in another way too. Huston’s a classic French leftist with mixed feelings towards the United States, whereas de Rosnay clearly has more positive feelings towards America. I found them very interesting to read together, and based on feedback from booksellers and readers, some prefer one, some the other. Next up, the elephant, or rather, the hedgehog, in the room. James Boswell, biographer and obsessive journalist, is perhaps known for his Life of Samuel Johnson. Some have called this greatest biography of all time, and you can read more about its creation in Adam Sisman’s Boswell’s Presumptuous Task. An iconic Boswell is also known as the logo for the Harry W. Schwartz Bookshops in the Milwaukee area. He represents our passion for books, and he’s also, like many a book lover, a little offbeat. Most people who see the logo in our shops and on our signage have no idea who that guy is. They also think he might be hungry; is that a sub sandwich in his other hand? I’m a bookseller, and that makes me one part bookseller and the other part merchant. So I offer my apologies for being a little more hard-sell than some blogs. I can’t help it—I’m passionate about what I like and have the need to share it. There’s one other piece of advice I picked up on the subject of selling from a powerful friend in publishing. Everybody’s selling something on a blog, but sometimes all they are really s elling are themselves. Not me. 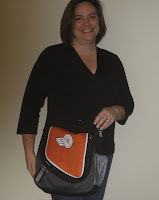 I’m more interested in getting the word out on our really swell Boswell messenger bag (purchase link coming soon). It’s 12x15 and fastens with Velcro. There aren't a ton of zippers and pockets, but hey, it’s only $19.50. Here it is, modeled by fellow bookseller Amie. You may recognize her from stints at Brookfield, Shorewood, and Downer Avenue. A woman of many talents, she’s currently one of our accounting folk, but she’s still very passionate about Milan Kundera’s The Unbearable Lightness of Being, and loves the new limited-run rack size edition at only $10. The other two in this series are Everything is Illuminated from Jonathan Safran Foer, and Chabon’s Mysteries of Pittsburgh. Please come in to one of our shops and take a look. The books are an interesting mix of trade and mass market paperbacks, an upmarket take on the deluxe $9.99 thrillers that have been popping up with slightly taller trims and bigger fonts. Harper says they will be available for a year or so, and then be replaced by new titles. Up next...what's with all these French books?